Civil Engineering is the oldest engineering discipline. Civil Engineering addresses to all aspects of the infrastructure facilities necessary for modern living such as buildings, transportation systems, bridges, tunnels, water supply and waste water treatments, environmental protection etc. Civil Engineering actually plays the role of nation building. 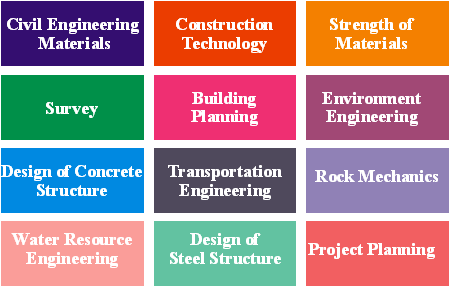 The department of Civil Engineering was established in the year 2011, which offers B. Tech. in Civil Engineering of four years duration & the intake capacity is 60 students per year. State-of-the-art laboratories, classrooms and infrastructure. On Site lecture and demonstration of practices including Mountain and Table Survey for Practical knowledge. Collaboration with reputed builders and firms. Placements in the Govt. and Private sectors like L&T, Tulsi Buildcon, Mangalam group etc. To become a department of excellence that brings out civil engineers with high technical competencies and promotes high-end research to meet the current and future challenges in civil engineering with social values. To Provide Quality Education in the domain of Civil Engineering. Fluid Mechanics & Hydraulic Lab. There is no one typical path for civil engineers but within each subfield the details of a career path can vary. Civil Engineering deals with the design, construction and maintenance of the natural built environment including works such as, bridges, roads, canals, dams, airports, highways, buildings, flyovers, tunnels, chimneys and offshore structures. The Branch plays a very critical role in water resource/environment. In India, a student who has degree in civil engineering can get the offer of salary started from 5 lakh per annum upto 20 lakh per annum. There is no criterion of salary for the brilliant or experienced candidate.